Breanna Stewart shoots and makes her last bucket of the night, for a career-high 38 points. Photo by Neil Enns/Storm Photos. 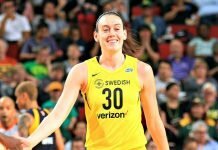 Seattle, Wash. – Breanna Stewart represents the future for the Seattle Storm. 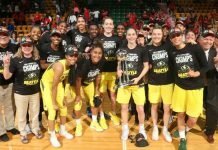 Sue Bird remains as the final link from the championships of the past. And from the outset, 2016 was going to represent a changing of the guard, as one era of franchise history bleeds into the next. And it couldn’t have played out better for Seattle than it did on Tuesday night against Atlanta. While Stewart shouldered the scoring load for the night with a career-high 38 points on 12-of-16 shooting — and put Seattle ahead with under a minute to play with a key and-one — it was Bird who sealed a 84-81 victory over the Dream with a jumper with eight seconds to go. Nursing a one-point lead, Seattle (6-9) forced an Atlanta (8-7) turnover with 26.8 to play. With such a small difference between the game and shot clocks, coach Jenny Boucek was fully expecting the Dream to foul quickly after the inbounds pass. The first-half played much like a replay of Sunday’s 98-81 victory over the Sun, where hot shooting more than made up for a disadvantage on the glass (Atlanta held a 24-13 rebounding advantage at the break). Of course, it was Stewart leading the charge with 20 points in the first 20 minutes, while Crystal Langhorne had eight en route to a season-high 18. Seattle also sported a new look off the bench early on, with newly-acquired guard Noelle Quinn and forward Krystal Thomas the first two substitutions for Boucek. The coach said both of them helped Seattle matchup wise against the Dream. But out of the break Atlanta — led by Angel McCoughtry’s 22 points and Elizabeth Williams’s 21 on the night — whittled the deficit to one by the end of the third quarter, and retook the lead just over a minute into the fourth. In the final quarter, the two sides traded baskets — with four lead changes and four ties — before Seattle used an 7-0 over the last 90 seconds to secure the victory. Seattle has now won two-in-a-row for the first time this season. Seattle is back at Key Arena to close out its four-game home-stand against Dallas on Thursday at 7 p.m. Bench scoring was nearly non-existent for either team on Tuesday. Atlanta had nine points from its bench, while a two-pointer from Jenna O’Hea was the lone basket from a Storm bench player. 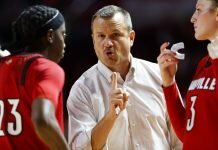 Markeisha Gatling, signed by Atlanta on Monday, was not with the team, while both Tiffany Hayes and Sancho Lyttle were out nursing knee injuries. 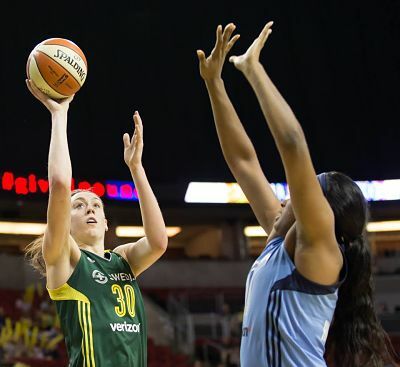 Abby Bishop remained out for Seattle while she trains with the Australian National Team, while Monica Wright did not play for Seattle (coach’s decision).